The gossip around procurement of French Mistral class assault landing ship (lead ship of Project BPC 160) for Russian Navy has not been subsided for over two years. For the first time general public heard about Mistral in October 2008 after a visit of Russian Navy Commander Vladimir Vysotsky to EURONAVAL exhibition in Paris. He kind of happened round the display booth of French naval company Direction des Constructions Navales Services (DCNS) with the model of Mistral in the foreground and said: "We're interested both in mutual developments and direct purchase of some types of French arms". Then was a year of obscure negotiations between Russian and French parties. A French warship which paid a friendly visit to St. Petersburg late in November 2009 was Mistral. The French are pragmatic people and would never waste fuel. On December 24, 2010 Russia and France declared about concluded agreement on construction of Mistral class assault landing ships at French shipyards. It is planned to build other two ships of this kind in Russia. What consequences this acquisition is fraught with for Russia? The catastrophic period for our armed forces started in 90's now has certain chances to turn for the better. At first glance, considerable efforts and investments are currently appropriated for revival of national armed forces. 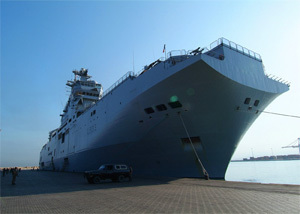 For instance, the premier Vladimir Putin promised at the recent congress of United Russia Party that "in 2010 state defense order will be increased on 8.5% and make RUR 1 175 bln…" However, in view of recent developments around Mistral there are some concerns those enormous funds could be channeled in a different way which has nothing common with recovery of national Navy and shipbuilding industry. Ships are not built without shipyards and design bureaus, without qualified engineers and shipwrights. That is why full-fledged restoration of industrial capabilities needs an every single cent of state defense order. How one should read statement of the Prime Minister answering the online question about Mistral: "Our industry must remember about competitors"?! Dear Vladimir Putin! Those competitors had a 15-year long advantage and considerable funds invested to new technologies, hardware and so forth. You must know it better. At first we should re-equip our design bureaus, shipyards, and at least two levels of their cooperative suppliers under, say, a sort of a national program. And then with a clear conscience we may demand competitive prices from the industry. While it is easy to rearm land forces and aviation in relatively short time, navy is in absolutely different condition. Shipbuilding is not a conveyor production. It is a piece, long-lasting and costly work. Any warship or submarine must be designed first. Taking into account periods of designing, building, and service of a ship, one should keep in mind that the ship's armament would inevitably get obsolete during this time. Therefore, any project must imply the most state-of-the-art weapons, sometimes only prototypes. After building phase, a ship must be manned by qualified crew (able to operate sophisticated hardware), and provided with basing site and maintenance infrastructure, i.e. all things making navy battleworthy. Formerly one of the world's most powerful navies – Soviet Navy (whatever they say of its imbalance, low efficiency etc.) – at the peak of its prime successfully opposed NATO's joint naval force. Soviet Navy had been effectively performing combat tasks all across the world; in some critical situations only presence of Soviet warships deterred Americans from exporting democratic values "on bayonets". Today only piteous dribs remained from that glorious navy. Old ships are being gradually decommissioned while new ones are being built with frightening slowness. Surface ships joined Russian Navy during recent years can be counted on the fingers of one hand – corvette Stereguschiy, small-size gunship Buyan… Sure, Severnaya Verf shipyard builds new frigates, but who knows when they will be in service? Veteran ships keep on getting rusty and obsolete, and it is surprising how Russian sailors manage to operate them and accomplish combat missions. Hence, the necessity for Russian Navy's renovation with new warships is obvious. We're at risk of losing our navy in 10 years unless we start building new ships. However, designing and construction of new ocean-going warships is a long and difficult process. It will take years, sweat and blood (they did not think of it while breaking up Soviet Navy). And thus some particular officials apparently believe that the simplest way is to import readymade warships. Indeed, there's no need to invest money in national industry, and get into all those rehabilitations, turnarounds, and re-equipments! You don't have to think either about revival of professional design bureaus, or qualification of their leaders succeeding eminent directors of the old school, or responsibility for possible deaths when testing new hardware and so on. It's a good idea to buy ready-to-use ships right now and let the industry slide. Our successors will clean up all consequences of such hands-off approach, if only there would be anybody to do it. But as long as all this things offend Everyman's ears ("how come Russian ship was built abroad? "), it is necessary to justify somehow such developments and affect public opinion. For a start, fervid partisans of arms import adduce the first argument and refer to national history.